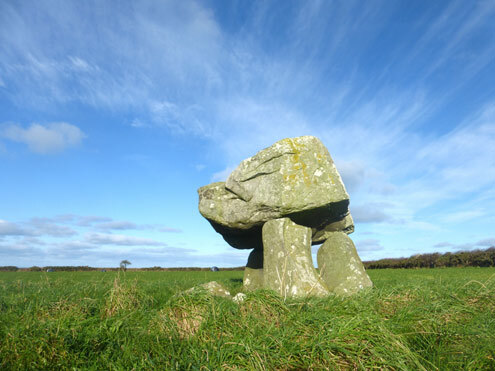 Llech y Drybedd, near Newport, Pembrokeshire, Wales - Neolithic Cromlech/dolmen. 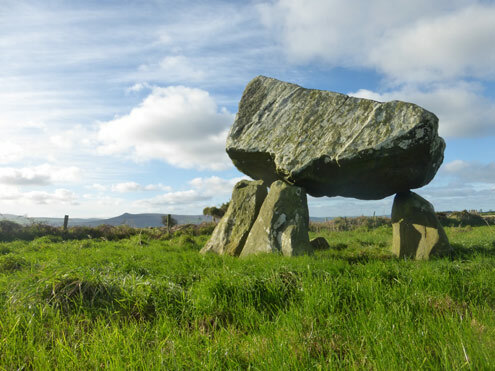 Small cromlech/dolmen situated in a field with spectacular views of the Preseli Hills. Standing in a field west of Moylegrove is Llech y Drybedd Cromlech. 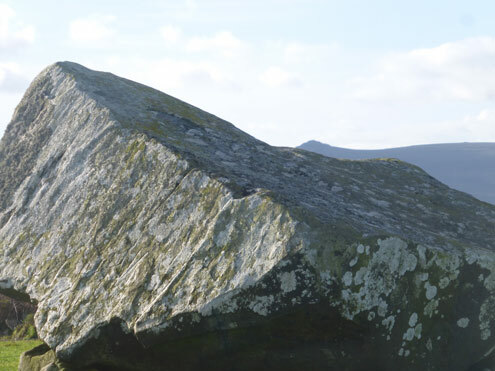 Ledgend has it that the capstone was thrown by a giant from Carningli Mountain to it's current resting spot. The location of this Cromlech is spectacular with views of the Preseli Hills and Carningli Mountain making this a very special place indeed. From a certain angle, the capstone certainly does appear to mimick the outline of Carningli Mountain, but the capstone shows no signs of having been crafted in any way or form - so possibly just a coincidence. How long this ancient site will remain standing will depend on the elements, the capstone has a sizable crack pretty much through it's entirity now, and also one of the uprights has split completely through. No Car Park - park in a sensible place on the narrow road or park in Moylegrove and walk, do not drive up the private farm track. Head on the coastal road to Moylegrove from Newport, when you start coming down hill after appoximately 4 miles, you will see a concreted private farm track on your right. This is the track that leads to Llech y Drybedd. It has a very small sign that mentions Cromlech. Follow this track on foot until it forks into two grassy tracks. Take the left track, and after a short distance you will see a style on your right. Over the style and in to the field - Llech y Drybedd will be right in front of you. Map showing location of Llech y Drybedd, near Newport Pembrokeshire.